I remember when I started my first job out of college. I didn’t know the first thing about what a good benefits package looked like. I definitely didn’t understand the concept of a 401k, let alone how to invest in one. When I received my first benefits package in the mail, I sifted through the plan literature and only grew more confused. In fact, I was so confused that I didn’t bother contributing to my 401k for over a year after I started working. Ironically, any advice I sought out served only to confuse me further. Looking back on it, it’s painfully obvious how few people truly understand the basics of investing. When I did finally start contributing to my 401k, I simply accepted the default investment settings which allocated a large portion of my contributions to company stock. I set up automatic contributions and forgot about it for another few years. 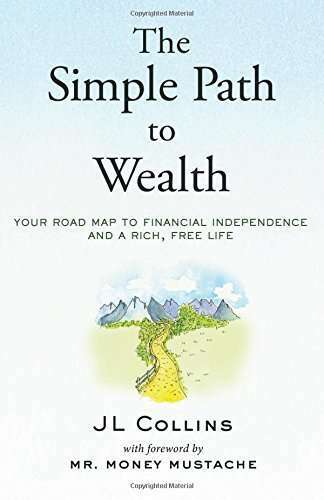 I wish I had read Jim (JL) Collins’ The Simple Path to Wealth before graduating college, or before turning twenty-five, or before turning thirty. It took me over a decade to learn the principles that are so well-articulated in this book. And I learned the principles because I sought them out on my own, having taken a strong interest in personal finance and investing. Admittedly, though, personal finance and investing in index funds aren’t the most exciting of subjects. Try to bring it up in a social setting and you will likely send people running way. They are the people who will benefit the most from reading this book. The best part of all is that Jim is such a down-to-earth, personable writer. He takes typically dry subjects and manages to deliver his points through stories, real-life case studies, and analogies that you would never expect. I’ll let you in on a secret: I still don’t pay attention my 401k plan literature. But I’ve learned everything I need to be a successful investor. I’ve learned I can ignore the confusing literature, the hot stock tips, the doomsday market predictions, and the complex products that are sold on commission. Therein lies the beauty of everything taught in this book: the principles behind successful investing and wealth-building are so shockingly simple, you will wonder how the wool has been pulled over everyone’s eyes for so long. If you read this book, you will know everything you need to be a successful investor. And you will be well on your way to living a richer, more fulfilling life. For more details, visit the book’s official website. Going on my christmas list for 2017! I have a copy, since I read it already. Glad to let you borrow it!